Ray Clemence - Liverpool's finest keeper - LFChistory - Stats galore for Liverpool FC! The interview with Ray Clemence started by us giving him a birthday present because it was his birthday coincidentally at the day of the interview. He thanked us for the kind gesture and for reminding him of the special day, because as years go by he tends to forget it's his birthday. Clemence is now 57 years old. We showed him his career stats at LFChistory and he was totally shocked at how many teams he had played against in his career at Liverpool. When he regained his composure, he was ready to answer a few questions on his life and career at Liverpool FC. I finished treatment three weeks ago [interview taken on 5th August]. I don't know if I am clear or not. I have to go back in September to find if the treatment worked [so he might already now know the results]. But I feel fine. The most important thing is being positive and getting on with things. The support I've had from Liverpool supporters throughout the world and other supporters has been fantastic. It's been a difficult 4-5 months, but I had the operation and then had radiotherapy since then. I feel fine, but until I go back to the specialist and they look again and say: 'Everything is clear now', which will hopefully happen in September, then I'll be ok.
Any special reason why you became a goalkeeper? I had six or seven games one season with 2nd division Notts County as a schoolboy, but they threw me out because they thought I wasn’t good enough. In football, you need to be in right place at the right time. I think I’ve had that. I had 46 appearances for Scunthorpe. I was a 17-year-old in my first year at Scunthorpe. The following season I missed the first two first team games and then played the rest of the first team games at 18 years of age. At the end of that season I moved to Liverpool. Liverpool scouts had watched the games, some of the directors as well and Bill Shankly watched me 3-4 times. Shankly said to me they watched me more than they had watched anybody else. They watched me for 10-12 games and then made their decision. Is it true that Shankly told you Tommy Lawrence was much older than he really was? Yes! When I signed for Liverpool Shanks told me Tommy Lawrence was over the hill and past his best and if I continued to improve I’d be in the “Big team” as he used to call it, within six months. When I got to Liverpool for pre-season after signing for them I found out that Tommy wasn’t over the hill and past his best. He was at the peak of his career and I had to wait 2½ years before getting a regular first team place. My Liverpool debut was against Swansea City at home in the League Cup. We won it 2-0. It was a horrible night, lashing down with rain and a gale-force wind. I had a particularily poor night when kicking the ball was concerned. I remember one soul shouting out from the Anfield Road end, knowing my kicking would put Swansea on the attack every time I had the ball: 'Clemence, take an early shower'. Obviously he didn't realise what was to come in the next 14 years. Clemence arrived at Liverpool 24th of June 1967 and made his first team debut on 25th September 1968, but his big break didn’t arrive until in late February 1970 when he was selected by Shanks in a 0-2 defeat to Derby in the league. Shanks wasn't deterred and Clemence, as they say, never looked back after that. You never demanded to leave the club? The first two years I played occasionally and I played in the England U-23 side while I was playing for Liverpool reserves. It was a learning curve for me and I was learning a lot about playing for a big club and watching how the first team played and what I would have to do when I came into the team. For the last half season I started to get a little frustrated that I wasn’t getting more chances and if I hadn’t gotten into the team that year then maybe at the end of that season I would have certainly asked a question that for me to improve I need to be playing first team football. Obviously you had a lot of memorable games but the game that most remember is the European Cup final of 1977 against Moenchengladbach. Because it was the first time that Liverpool had been through to a European Cup final. It was a special season for us as we nearly won the treble. We had won the League one Saturday, lost the FA Cup the following Saturday and won the European Cup four days later. It was a special time in Liverpool’s history, a special time for the fans because the season had just been incredible. For the last three months of the season we were going from an important league game to a quarter-final in the FA Cup, another important league game, the quarter-final of the European Cup. The last three months were one massive game after another. To win the League was one thing, we had done that before. To lose the Cup was a blow to us against Manchester United. Then to win the European Cup under the circumstances we did... It was a fantastic night. To have 26,000 fans there who had done everything they possibly could, had sold things, pawned things, just to be at Liverpool’s first European Cup final. To win it in the style we did and then the homecoming... Anybody who was a member of that team or anyone who was a fan at that time will always remember that because it was so special. People over the years have asked me, 'What have been your best saves'? People tend to think that you would say, 'It was the one when I flew into the top corner and tipped it over the crossbar'. I tend to look at the saves in terms of how important they were to the game. Therefore the save from Stielike was one of the most important ones I ever made. It wasn’t a spectacular save but just the time of the game and the importance of it. We were 1-0 up and playing very well. Mönchengladbach had a little spell after half-time when they got on top of us. Simonsen scored a great goal and within 5 or 10 minutes of that Stielike broke through. Him against me. I did what I always did. I tried to make myself as big as possible, spread myself at his feet and luckily he hit me with the ball. 5 or 10 minutes later Tommy Smith headed into the net and we went on to win the game. I am not sure in the mental state we were in, if we had gone 2-1 down having just lost to Manchester United on the Saturday as well, we could have come back from that. So for me that was probably the most important save I ever made, certainly matched alongside the penalty save I made in the UEFA Cup final at Anfield in the first European final I ever played in. Again at the time it didn’t seem important. We were winning 3-0 in the first leg at home and Stevie Heighway gave away a penalty. Jupp Heynckes took that penalty and I managed to save it. It was only 10 or 15 minutes of the game to go. We went out to Germany two weeks later for the 2nd leg and we were 2-0 down in 20 minutes and finished up losing the game 2-0. If I had conceded the goal at Anfield they win the UEFA Cup on away goals. So it’s pretty much on par with Dudek’s double save from Schevchenko in extra time vs. Milan? Was there one particular striker that was hard to be up against? I never feared strikers, but I had great respect for strikers. I was lucky enough to play against some of the greatest strikers in the world. I played against Pele towards the end of his career. I played against Maradona, Cryuff, Neeskens, Zico, Rivelino.... I was lucky to play against most of the best strikers at some stage in my career. 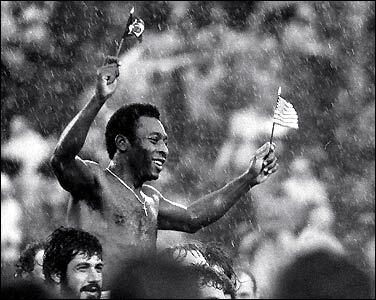 Pele was special. He was coming towards the end of his career, playing in America, but you could still see the incredible skills he had. I played against him in the Bicenntenial tournament in America in 1976. England went across and played in a tournament against Brazil, Italy and Team America. Pele didn't score, no, no..